File Photo to illustrate Measles Vaccination. The Oyo State Government has deployed over 8,000 officials for the 2018 Measles Immunisation across the state. The officials, numbering 8,351, will serve as House to House mobilisers, facilitators and town announcers. They will carry out the campaign from March 15 to March 27. 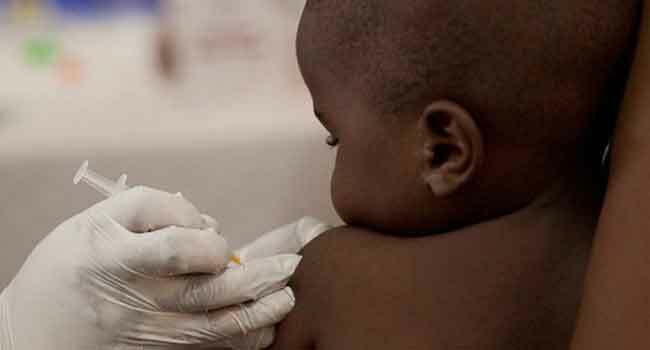 The Commissioner for Health in the state, Azeez Adeduntan, while monitoring the Measles Vaccination Campaign at Ibadan North Local Government area said the government is committed to ridding the state of infant mortality. “Oyo State Government is committed to ensuring that children between the ages of nine months to five years do not die prematurely and also reduce maternal mortality,” he said. This decision propelled the state government to engage the huge number of personnel for the 2018 measles vaccination campaign. The campaign will cover the 33 Local Government Areas (LGAs) and their LCDAs in the state. It will be in two phases with the first phase covering 17 local government areas and the second phase will cover the remaining 16 LGAs. The Commissioner allayed the fears of mothers over the rumour that measles vaccine and immunisation will allegedly kill their children. He said the immunisation is very important for the well-being of the children and has no side effect. He enjoined mothers to cooperate with health officials to immunise their children in all primaries healthcare centres and other designated centres assigned for measles immunisation exercise within the state to ensure that no child is left behind during the exercise.